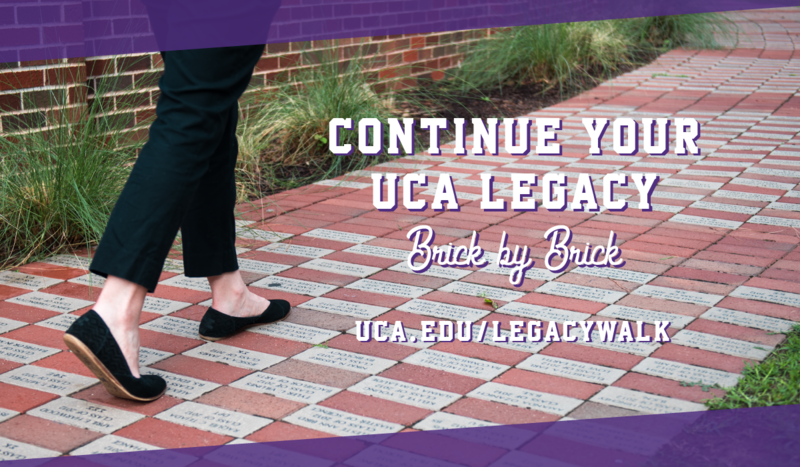 The Office of Annual Giving invites all graduates to commemorate their UCA experience with a personalized brick on the UCA Legacy Walk. The Legacy Walk is incorporated in the amphitheater that is located in the common area in front of the student center, near Old Main and Ferguson Chapel. The Legacy Walk begins with the graduates from 1909, which is the first graduating class year. Order your brick by August to ensure your brick will be installed by Homecoming 2019! Bricks can be ordered online. For more information, contact the Office of Annual Giving at 501-450-3470 or email lnorris4@uca.edu.